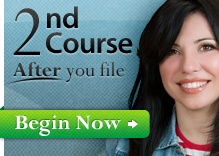 Okay… after you’ve received your Bankruptcy Credit Counseling certificate and filed your bankruptcy documents with the court, it’s time to take the second required bankruptcy course, known as the Debtor Education course. 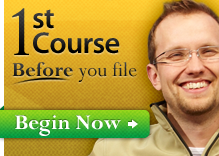 This pre-​​discharge debtor ed bankruptcy class is part two of bankruptcy classes, one of the last things you need to do to complete the bankruptcy filing process. The Financial Education Services SM Pre-​​Discharge Debtor Education Class is an informative personal financial management course to help you manage your money even better. The completion of this Debtor Education course, also known as the “post-​​filing” or “post-​​bankruptcy” course, is required by law in order to have your debts legally discharged by the bankruptcy court.